This was a Christmas gift for my mother in law who owns an art gallery in Southport NC. My 10 year old daughter helped me tile the roof. 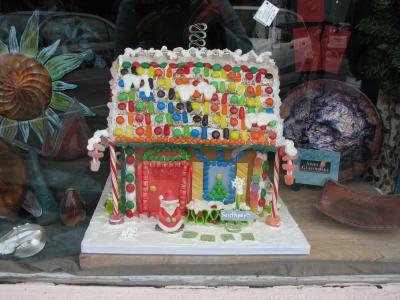 The house is made of real gingerbread, frosted mini wheats, gumpaste, royal icing, rock candy, sugar glitter and commercial candy. When I make a gingerbread house I want it to be as colorful as possible. I love the colors--very festive for the Holidays. Ibet your mother in law was very pleased!